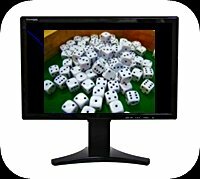 There are many great free dice games! I'll happily guide you in the right direction. In no time, you'll be shaking dice on your iPhone, playing a game on a web site or playing an original game with friends. Be sure to look at the Brand New Dice Games section for original, never-before-seen dice games. Dice games actually make good online games too. Most games require strategy and risk taking, making them both challenging and entertaining. Many of the games allow you to play against friends or the computer. Note: If you want free instructions for classic games with real dice (the kind you hold in your hand), then pop on over to my how to play dice page. You'll find easy to learn games with free score sheets to download for many well known games. Dice games are one of many types of great indoor party games. Please remember that "free" is not always "free" on the Internet. Often, there are unwelcome strings attached. Devious folks use "free" games to entice you to click a link or download a software program. Your click on a link may invite a flurry of pop ups onto your screen or trigger the installation of damaging spy ware onto your computer. Fear not! I'll guide you to safe games that are truly free. I'd recommend them to my own mother. So, let's go find those fun, free dice games! For starters, a good source of safe, free dice games can be found at Yahoo Games. Along the way, I may mention a few good games that (gasp!) you have to pay for. If you're a fan of dice, you may find it worth a few dollars to buy a fun game. I won't ignore a good game just because it comes with a price tag. Because I like to read well organized content, I assume you do too. I'm going to group these online dice games into two main categories: Internet (web sites) and Software (for a computer or mobile devices). Be sure to check back often. I'm always on the look out for new games. I'll add the best ones to this page so you can enjoy them too. Here they are! You've found them: original, never-before-seen free dice games. I can make that claim with confidence because I created these games. Since I'm new to inventing dice games, your feedback is vital. Please play these games and then let me know what you think. Your suggestions can help improve a game for dice fans around the world. I'll give credit where credit is due too. For my first game, I combined my two passions: soccer and dice. With the 2010 World Cup Soccer Tournament a few months away, I got inspired and created Goal! The Ultimate Soccer Dice Game.